Welcome to the showcase for gourmet foods and beverages from California. Highlights from the Savor California booth at the Winter Fancy Food Show 2018, full of the most innovative specialty foods and beverages. Shop for artisan foods and beverages made by the many producers on Savor California who have online stores. 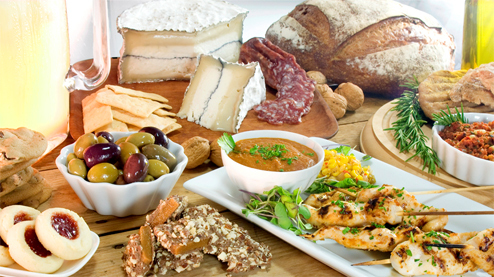 Sample the rich variety of gourmet foods on Savor California by attending a food event. Plan a food lover's tour of producers who have locations you can visit during your travels in California, and discover unique regional specialties. For email notification of new editions of our online newsletter, please sign up for our mailing list. Introduce a friend to the pleasures of SavorCalifornia.com. Check back often to see new gourmet foods from other artisan specialty food producers all over California. Click here for a full list of all of our food producers. Click here for a full list of all of our recipes.